If you really want to build your coaching business you must accept that time for the thriving coaching generalist is over. Differentiate or die is your wakeup call. The future belongs to coaches who are willing to vulnerably align with and boldly express their core individuality so that they offer prospective clients a radically distinctive choice from all other coaches. Due to the Web, we live in a time of ever-increasing visibility and transparency. So much so that it has become more important than ever to really know and express what makes you distinct from everyone else in your profession. Today the speed of change and the ever-increasing availability of overwhelming information have created more rapidly closing windows of opportunity, so more than ever before it is important to differentiate your coaching practice from all others. In the future only coaches who are truly experts in deep and narrow niches will survive. In all of your marketing you must answer this question that gets to the heart of your most valuable selling point. Every coach who has built a practice knows that one doesn’t sell coaching because very few are looking to buy coaching. Prospective clients are buying desired outcomes and solutions to pressing problems. They often know exactly what they want and if your specialty doesn’t clearly speak to what they are already searching for then you aren’t even being considered. If you are still trying to build your coaching business by being all things to all people, it’s time to become the expert you know you could be. They lack a clearly defined expertise and marketplace advantage. They are often uncomfortable with self-promotion. They aren’t consistently using an aligned marketing strategy that values their individuality. This lack of differentiation and focus causes coaches to doubt their own capacity to build a practice and doubt their execution of marketing tactics. Niche-choosing misconceptions that further get in the way of effective business-building. Thinking that doing what you love is enough to build a business. Simply doing what you love is too broadly framed to give a distinct advantage. Now and in the future you must also give clients exactly what they need in the way they want to buy it. Choosing an ideal client niche based on economic feasibility alone is too outside centered to be accurate. Choosing an ideal client niche based on demographics alone is too broad to be distinctive. Continually searching for missing solutions by attempting to mimic successful experts’ marketing leads you further away from developing a marketing strategy that’s aligned to your unique makeup and desires. Believing the fearful conclusion that narrowing your niche limits possibilities. Of all the things you can do there is one thing that you can do better than anyone else. 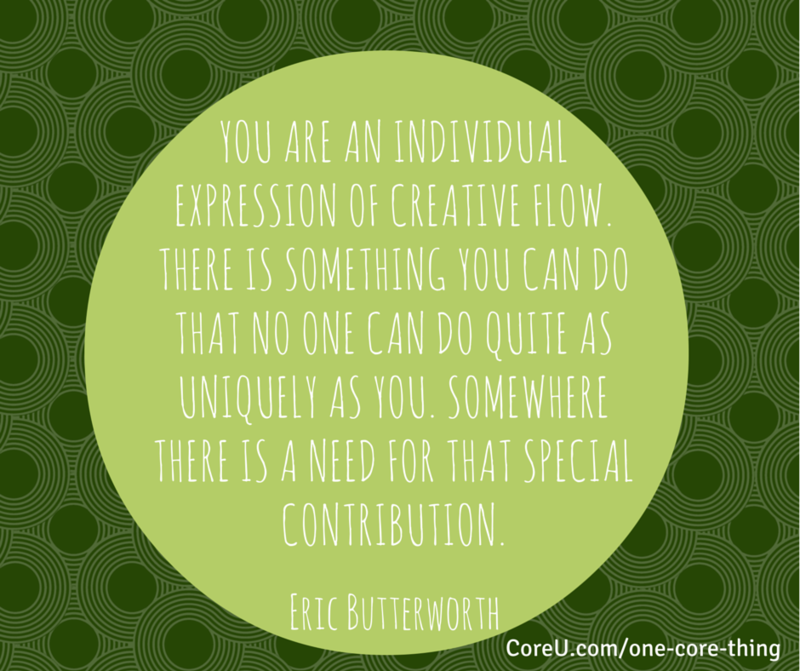 That one core thing is elemental to your nature and allows you to come into your own while standing out. Distinctively expressing this one core thing, in a way that others desire it, is essential to enjoying both deep fulfillment and lasting prosperity. Playing small serves no one; go for the biggest possible dream that honors who you are. Compromising or dialing down your core distinctiveness will lead to mimicry and failure. Expressed uniqueness is rare and what’s rare is most highly valued. Your most valuable selling point is found at the intersection of your unique individuality and your ideal client’s most desired buying point. The most effective way to build your coaching business is to highlight the one core thing that you could be best in the world at delivering. This is not the thing that you want to be best at. It is also the one thing that of all your capabilities is most highly valued by your clients as well as the client outcome that you deliver more effectively than anyone else. 1. Increase your awareness of what’s possible by asking powerful open ended questions. Don’t rush to answer the following questions. Instead allow them to simmer in your imagination until your awareness expands. What would it look like to see far beyond the contextual reality of coaching as we know it? What would it take for my one core thing to reveal itself easily and effortlessly? What’s possible for my coaching practice beyond anything I can now imagine? What fixed viewpoints about coaching are keeping me from seeing greater possibilities? 2. Interview your most satisfied clients to determine the answers to these questions. What is the most valuable outcome of our working together that you could not have easily reached on your own? What’s the essence of what I did to guide you to see and choose that outcome? You could also join us for this powerful teleclass on September 1: Discover Your One Core Thing & Get More Clients. You can be viable and relevant in the future of coaching as long as you build your coaching business on a foundation of differentiation. Begin today to discover and embrace what makes you different and the future shall be yours. Tom Volkar guides solo service providers who want to start and grow an ideal business that is aligned with their individuality. Download your free guide, Choosing Your Ideal Niche: How to Decide with Confidence and Prosper from Your Signature Edge. Upcoming Collaborative Conversations How have YOU benefited from being part of ICF Pittsburgh?